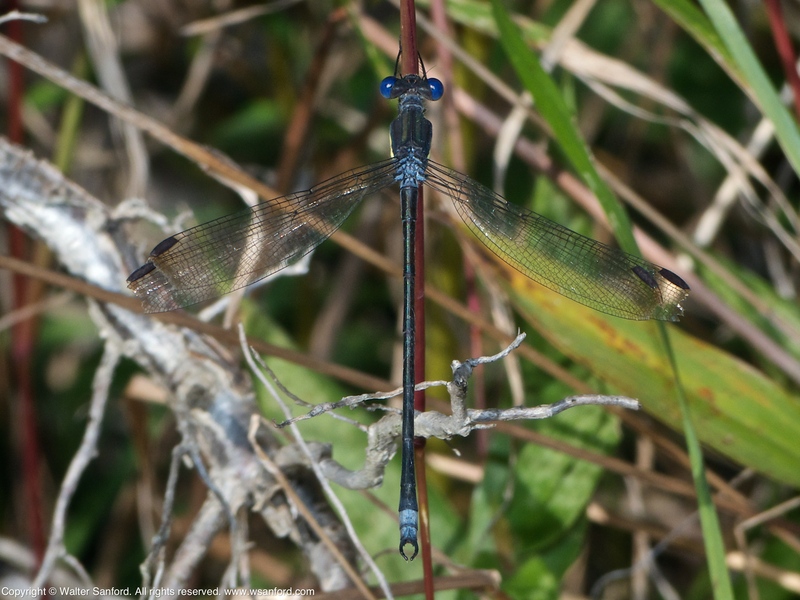 I’m fairly certain all of the photos in this post show the same male Great Spreadwing damselfly (Archilestes grandis) that I discovered on 09 October 2014 at Huntley Meadows Park. 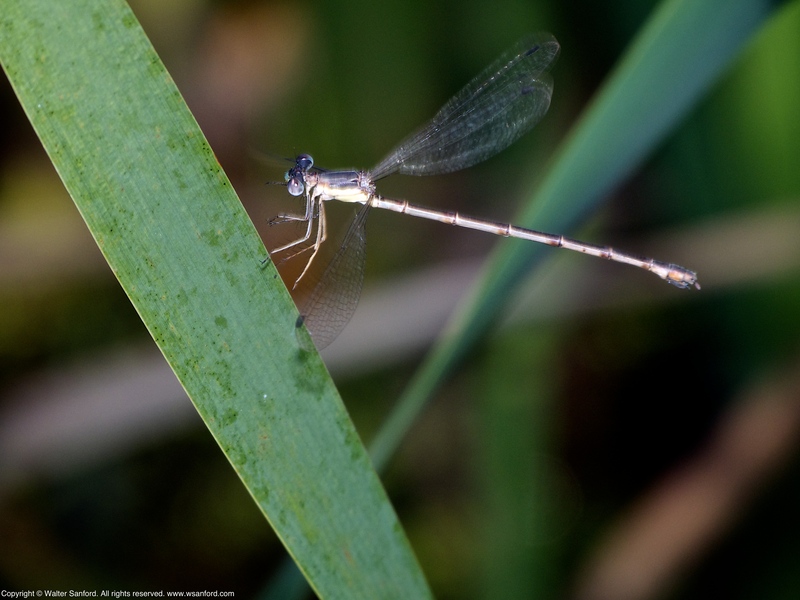 The wingtips of this damselfly are very distinctive — it’s hard to imagine another individual with similar damage to all of its wings! I call him “Crinkle-cut” because it looks like his wingtips were trimmed with a pair of crinkle-cut craft scissors. “Crinkle-cut” is VERY aggressive — he’s a great spreadwing and behaves like he knows it! 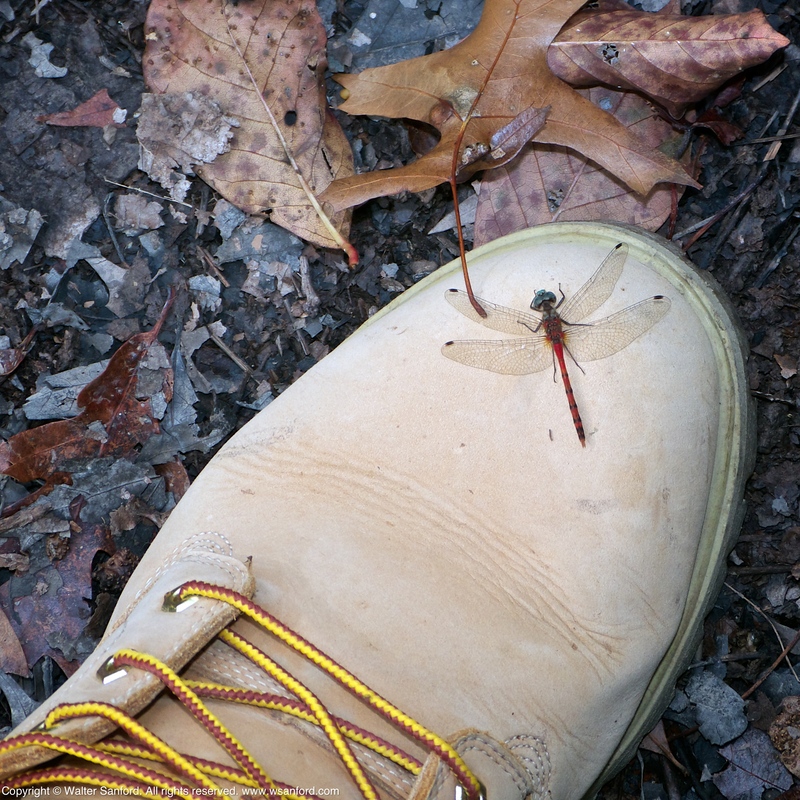 Whenever another odonate enters his “space,” a wild aerial duel occurs and the invader is vanquished quickly! 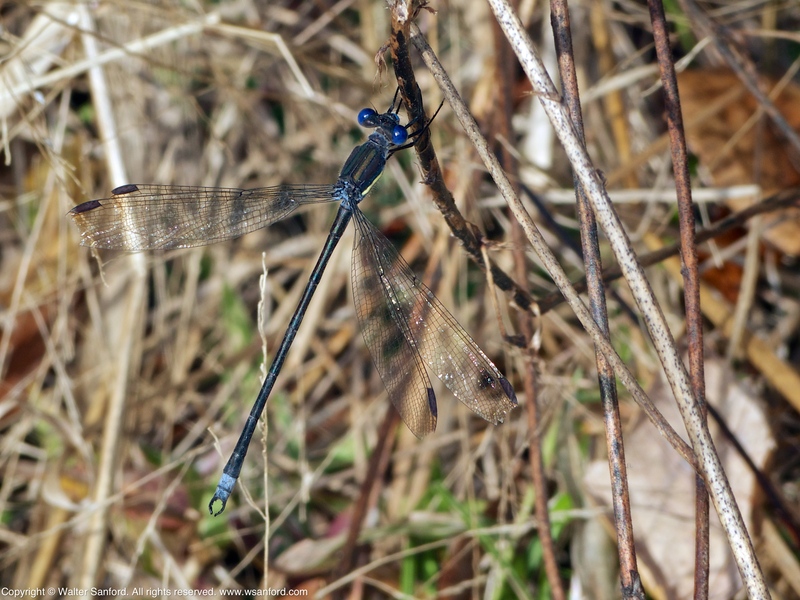 My theory is Crinkle-cut’s wings were injured as a result of multiple turf battles; other experienced odonate-hunters speculate his wings were damaged during emergence. I’ve seen “Crinkle-cut” three times since the first sighting on 09 October 2014: 17 October; 20 October; and again on 24 October. I did not see him during photowalks on 27 and 30 October. Photos of my sightings are shown in reverse-chronological order. Copyright © 2014 Walter Sanford. All rights reserved. 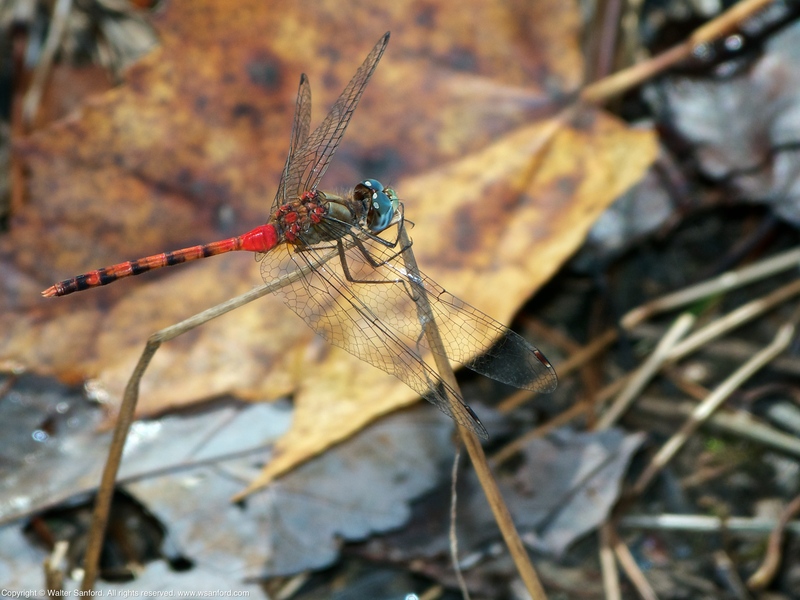 This is the first installment in a series of themed posts featuring photos of Blue-faced Meadowhawk dragonflies (Sympetrum ambiguum) spotted while photowalking Huntley Meadows Park during Fall 2014. All individuals are males, as indicated by their coloration and terminal appendages. One of my overarching goals this fall is/was to shoot pictures of my favorite species of dragonfly against a background of autumn foliage. The color and clarity of these photographs is enhanced by using an external flash unit to add “fill” light. … the real secret of wildlife photography is fill flash. Fill flash is one of the key techniques for easily improving wildlife images. Electronic flash improves the color balance of the image, improves color saturation, fills in dark shadows with detail, adds a catch light to an animal’s eye, and may help increase sharpness.” Source Credit: Wildlife Fill Flash. Please view full-size versions of the following photos in order to fully experience the glorious shades of autumnal color that make these images pop. Those who know me well are familiar with one of many “Walterisms”: “I haven’t ‘seen’ something until I have photographed it.” My rationale is two-fold: 1) A photograph verifies a sighting. 2) The detail visible in a good photograph exceeds the acuity of the human eye. 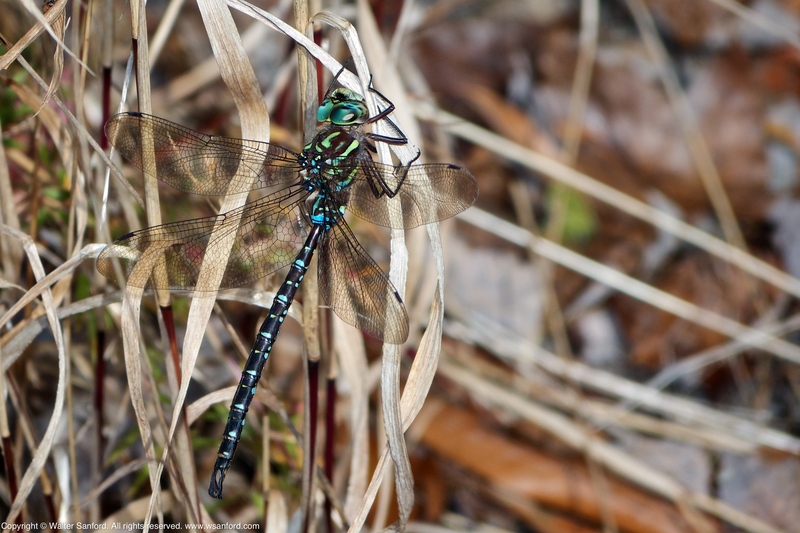 Although I have spotted Shadow Darner dragonflies (Aeshna umbrosa) in the past, I hadn’t “seen” them until I photographed several of these handsome darners near a vernal pool in the forest at Huntley Meadows Park on 24 October 2014. 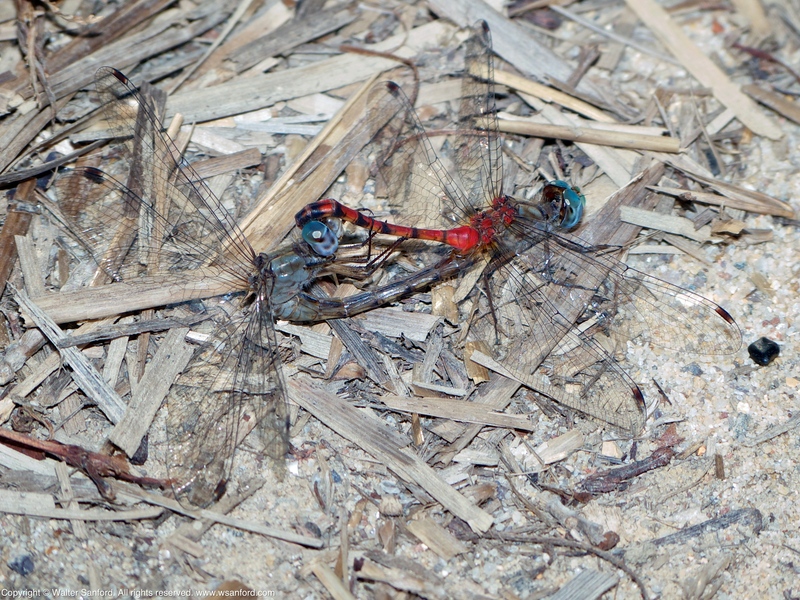 This post features photos of two male Shadow Darners (as indicated by their terminal appendages): the first male is shown in Photos 1-2; the second in Photo 3. 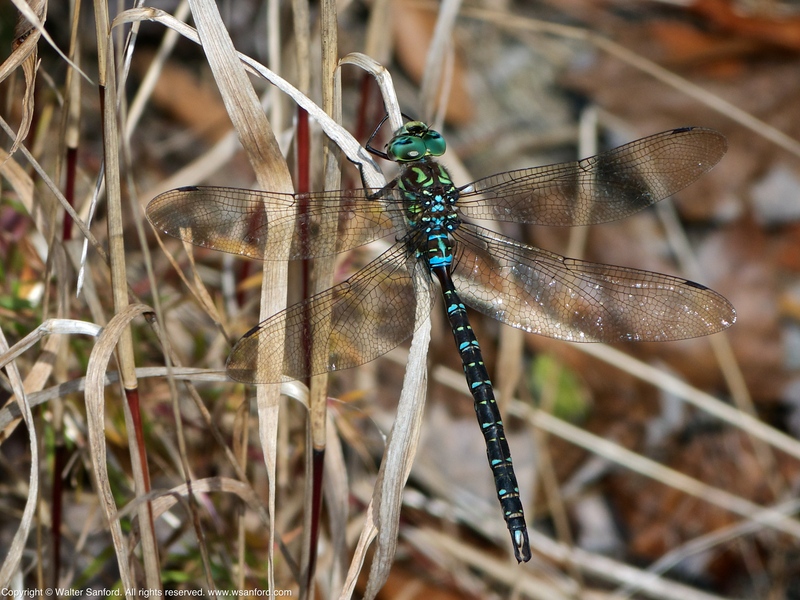 Swamp Darner dragonflies (Epiaeschna heros) look somewhat similar to Shadow Darners: Swamp Darners are a spring species in the Darner Family; Shadow Darners are a fall species of mosaic darner. Both species seem to prefer the same habitat. All things being equal, Swamp Darners are more numerous than Shadow Darners: I saw LOTS of Swamp Darners during spring; in contrast, I’ve seen only a few Shadow Darners during fall … so far! The following side view of another male Shadow Darner shows its face, the side of its thorax, and its hamules (located beneath S2-3, that is, abdominal segments two and three). Remember that odonate abdominal segments are numbered from front to back. Do you ever shoot the same subject at the same time with another photographer and compare the results afterwards? It is fascinating to see how the choice of equipment, individual shooting styles, and angle of view affect the results. 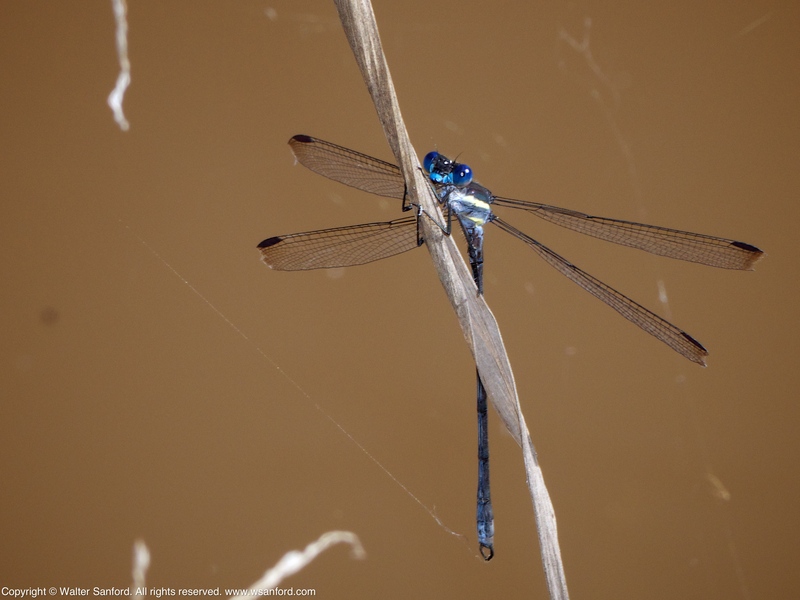 Recently I was walking at Huntley Meadows Park, the local marshland park where I take a lot of my nature photos, with fellow blogger and photographer Walter Sanford when he spotted a mating pair of Blue-faced Meadowhawk dragonflies (Sympetrum ambiguum). Eventually they landed on the ground and Walter and I took up our shooting positions. 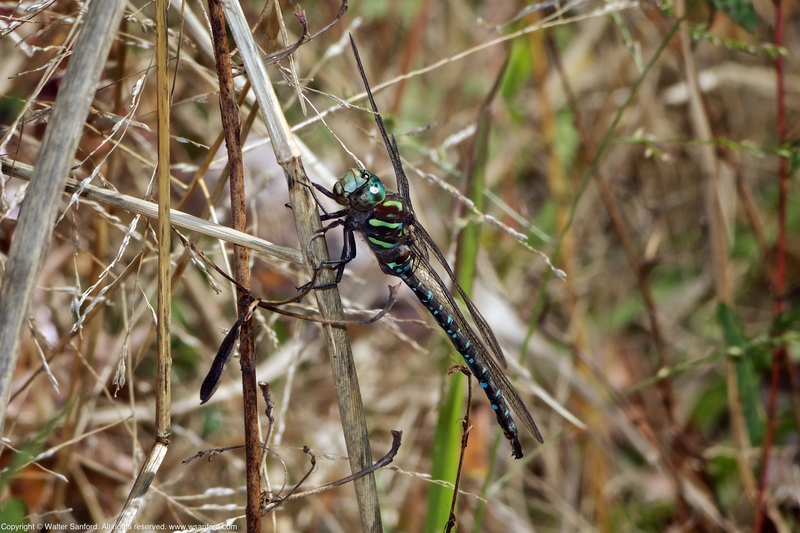 He was standing, facing the sun and I was crouching (and eventually sprawling flat on the ground) on the other side of the mating dragonflies, trying desperately not to cast a shadow on the action. 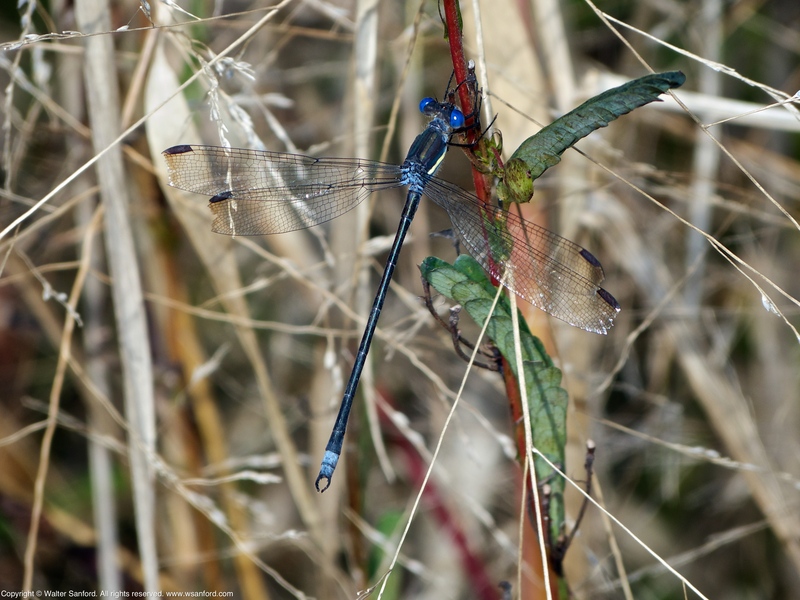 I spotted a mating pair of Blue-faced Meadowhawk dragonflies (Sympetrum ambiguum) during a photowalk with Mike Powell at Huntley Meadows Park on 20 October 2014. I took a step or two toward the pair and they flew away. 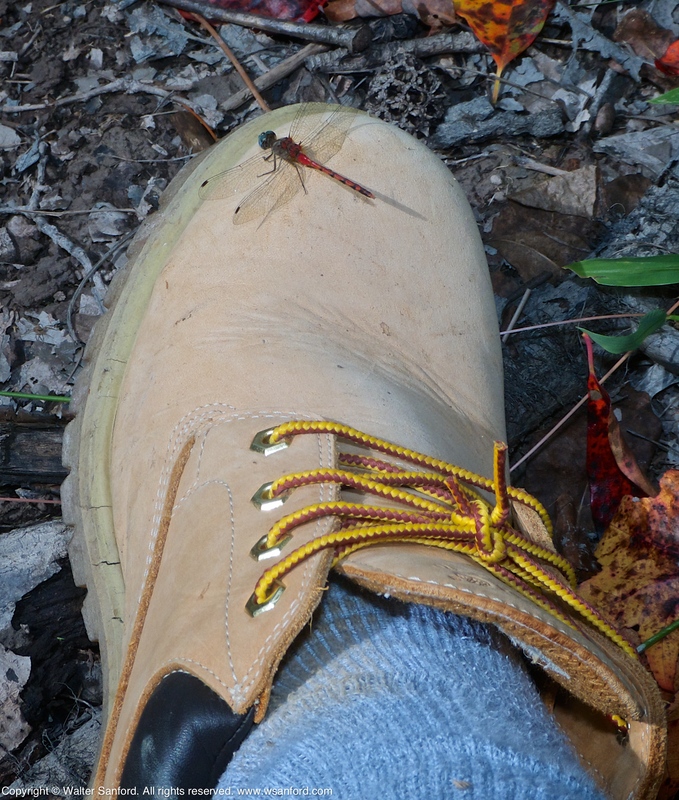 I followed the dragonflies to a nearby location where they stayed for quite a while. I positioned myself so my line of sight was perpendicular to the dragonflies, with the pair back-lighted by the late-afternoon Sun; Mike took the other side. I was shooting photos with my superzoom camera and an external flash; Mike was shooting close-up photos with a DSLR and macro lens. The situation reminded me of a familiar expression: “There are two sides to every story.” The following photos tell my side of this story. 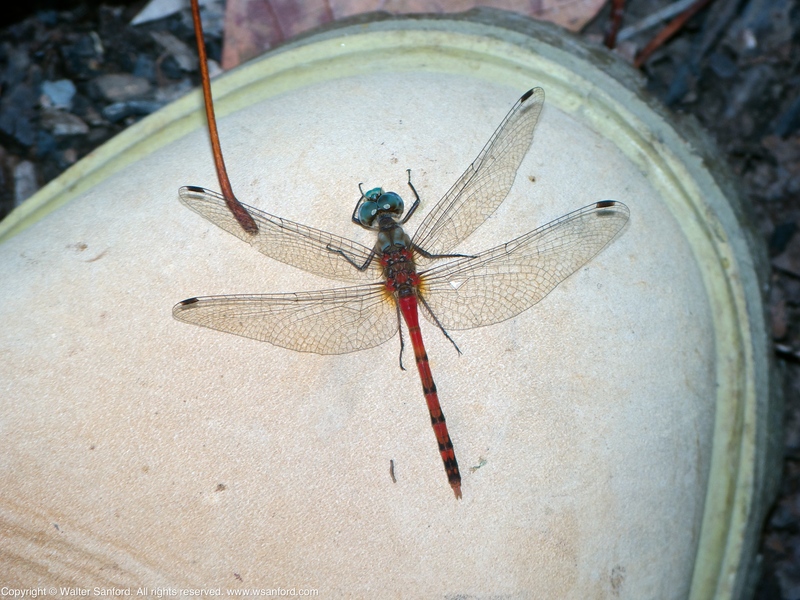 The copulatory, or wheel, position is unique to the Odonata, as is the distant separation of the male’s genital opening and copulatory organs. Source Credit: Paulson, Dennis (2011-12-19). Dragonflies and Damselflies of the East (Princeton Field Guides) (Kindle Locations 377-378). Princeton University Press. Kindle Edition. All dragonflies and damselflies have a 10-segmented abdomen: male dragonfly secondary genitalia are located in segments two and three (2 and 3); female genitalia in segment eight (8). 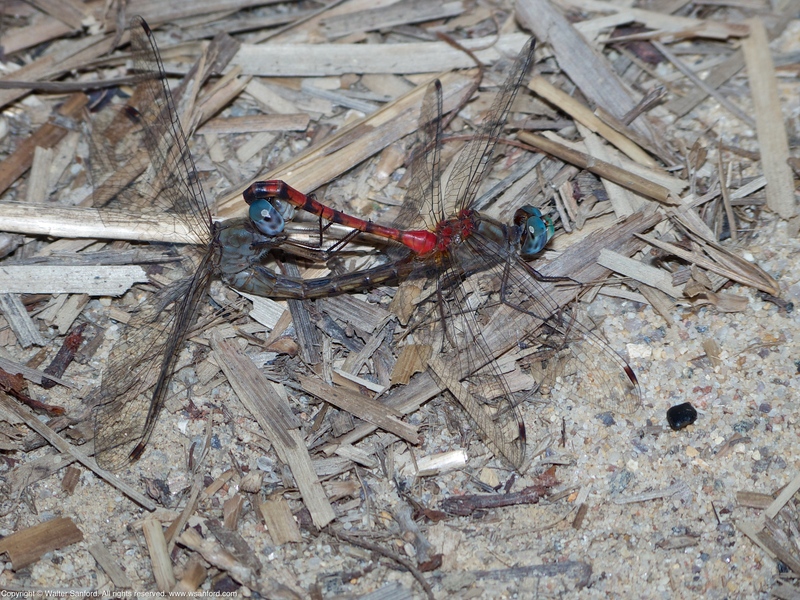 Therefore, the male dragonfly is on top; the female is on the bottom. 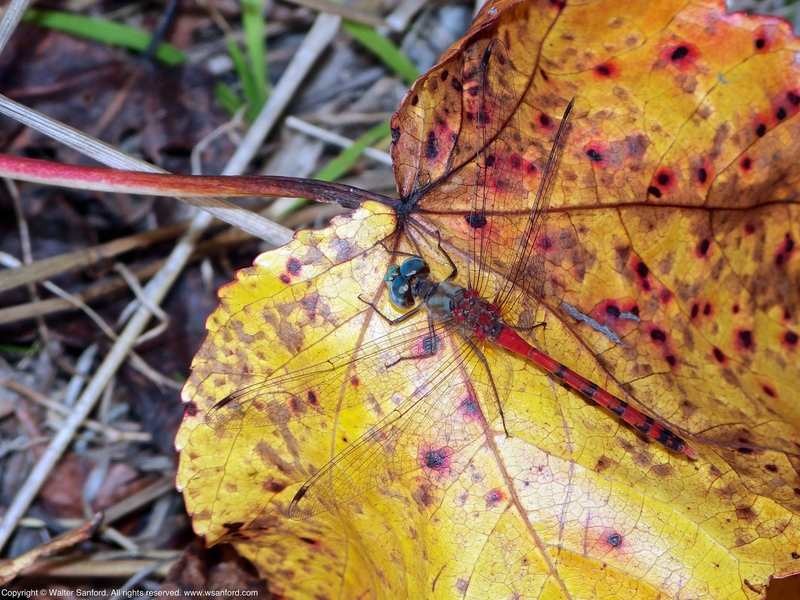 Nothing says “Autumn!” quite like the Blue-faced Meadowhawk dragonfly (Sympetrum ambiguum). This individual is a male, as indicated by its coloration and terminal appendages. 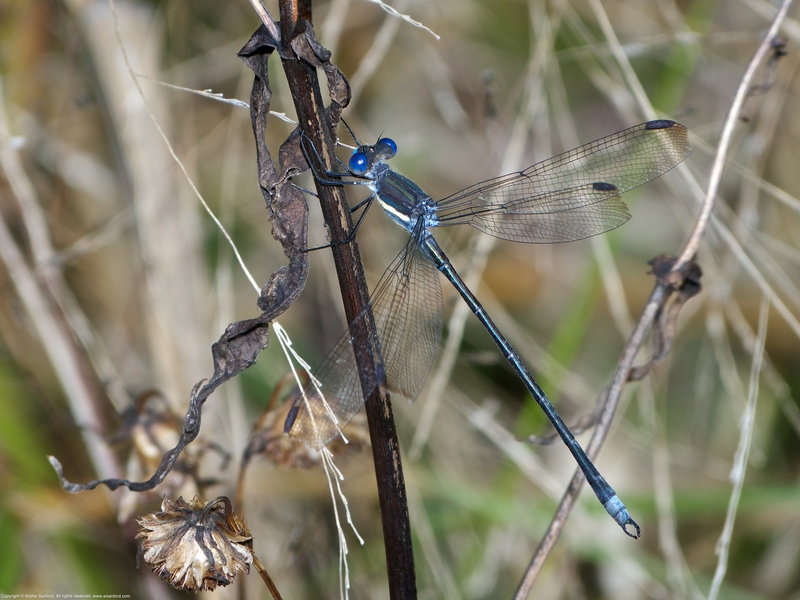 I spotted this specimen near a vernal pool in the forest at Huntley Meadows Park on 06 October 2014. I love a good head-tilt! 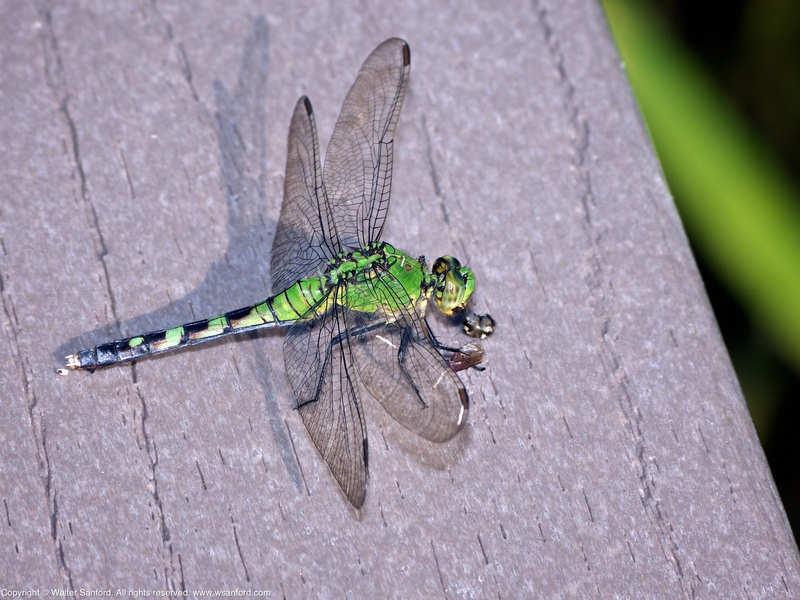 The following Eastern Pondhawk dragonfly (Erythemis simplicicollis) was spotted toward the end of a long photowalk at Huntley Meadows Park on 17 September 2014. This individual is a female, as indicated by its green coloration and white terminal appendages. 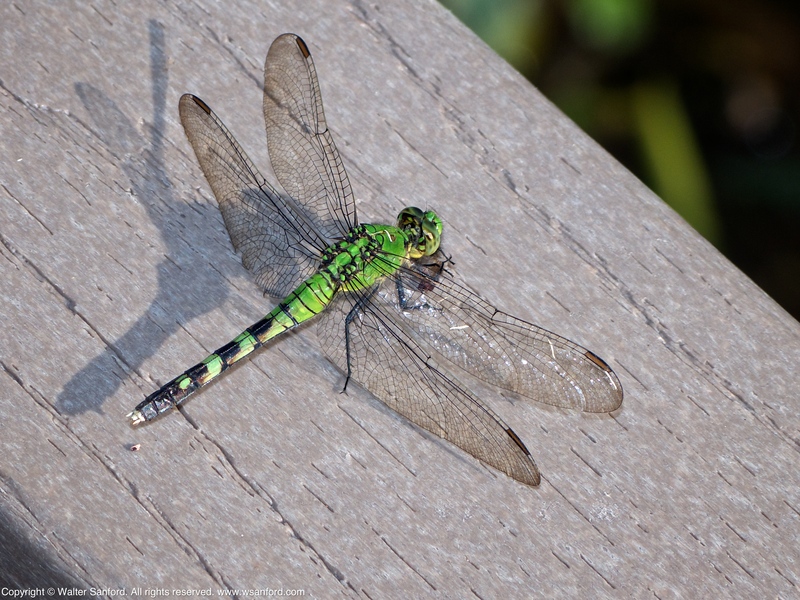 Like many species of dragonflies in the Skimmer family, the Eastern Pondhawk usually perches on four of six legs, with the two front legs curled around its head. I noticed the pondhawk’s front legs moving in front of its face and guessed correctly the dragonfly was eating some type of prey. Voracious predator, especially females, eating odonates of all kinds their own size and smaller, … Source Credit: Paulson, Dennis (2011-12-19). Dragonflies and Damselflies of the East (Princeton Field Guides) (Kindle Locations 10223-10224). Princeton University Press. Kindle Edition. 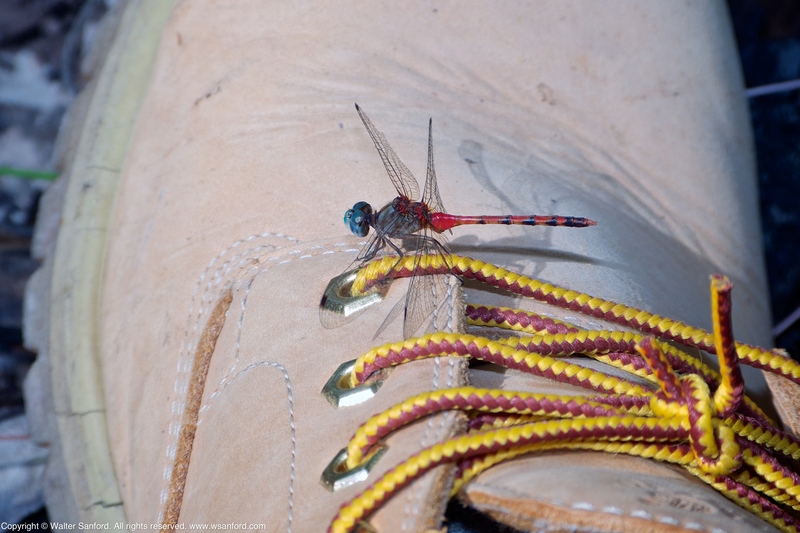 Dragonflies use their front legs like a “basket” to catch prey in mid-air. Look closely at the full-size version of the following photo, showing the female eating a winged insect cradled in her front legs, possibly either a bumble bee or carpenter bee. 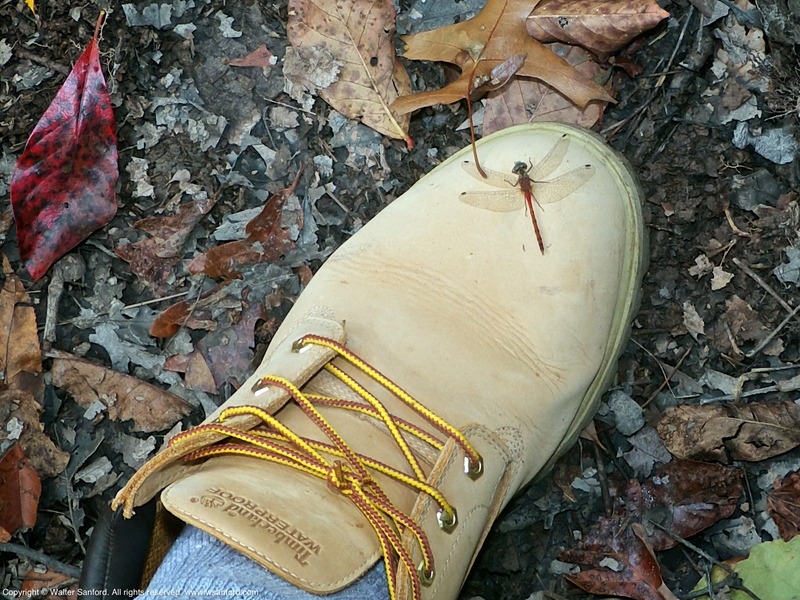 Arboreal dragonflies — dragonflies that live in or among trees — like timberlands. Timberland Boots, that is. 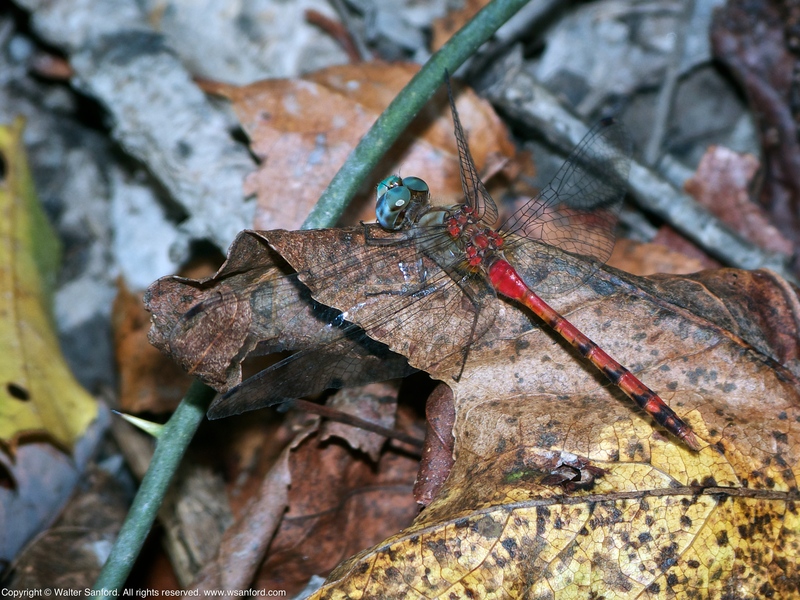 Perhaps you’re thinking, “Hey, I see what you did there!” But seriously folks, Blue-faced Meadowhawk dragonfly (Sympetrum ambiguum) is a habitat-specific species of odonate that prefers forested locations. Habitat: Temporary pools with sedges, wetland grasses, and often mosses, including sphagnum. Usually in woods. 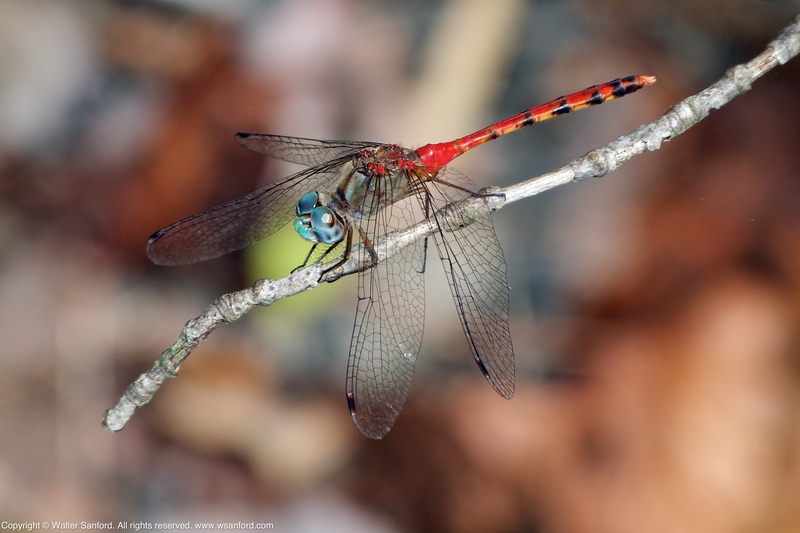 Source Credit: Blue-faced Meadowhawk. Dragonflies of Northern Virginia by Kevin Munroe, Manager, Huntley Meadows Park. 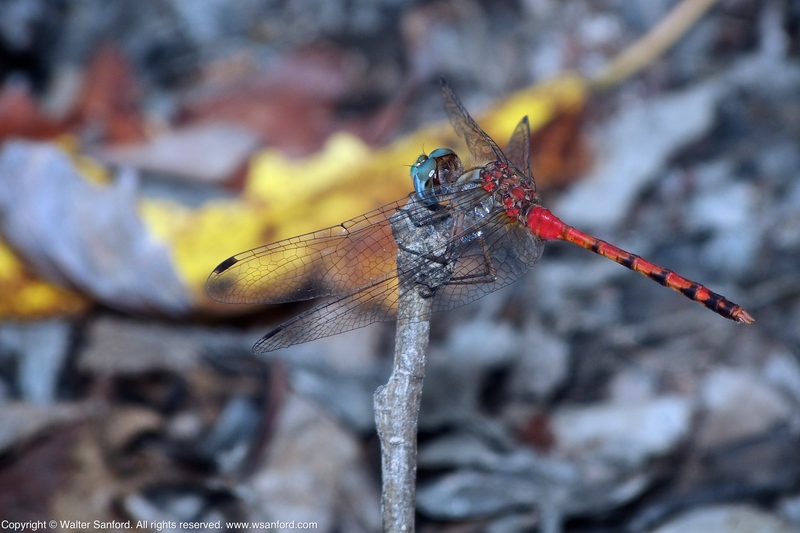 The following Blue-faced Meadowhawk dragonflies were spotted near a vernal pool in the forest at Huntley Meadows Park on 14 October 2014. Both individuals are males, as indicated by their coloration and terminal appendages. 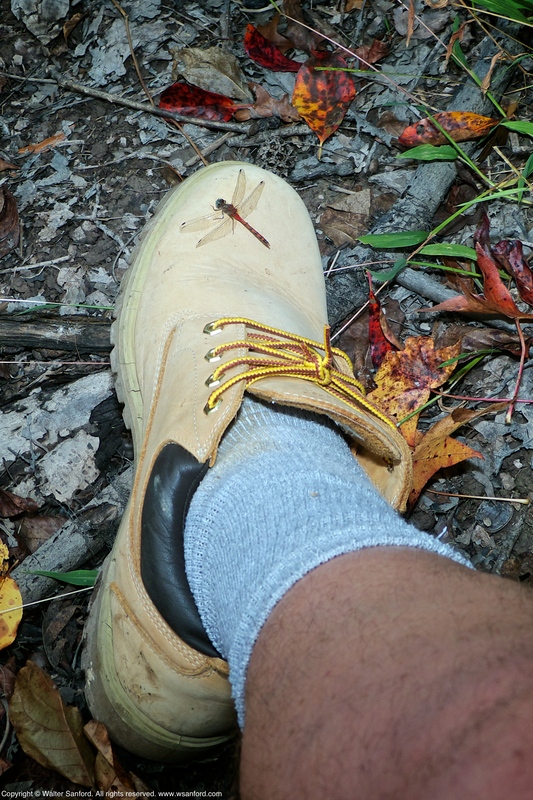 The dragonflies are shown perching on my boots. 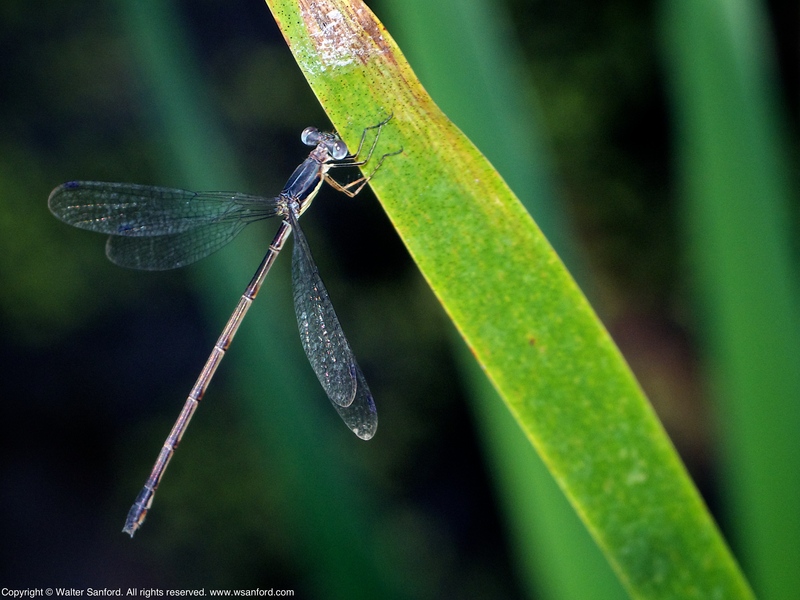 Editor’s Note: Odonate research is an area where amateurs, like me, can contribute to what is known about dragonflies and damselflies. 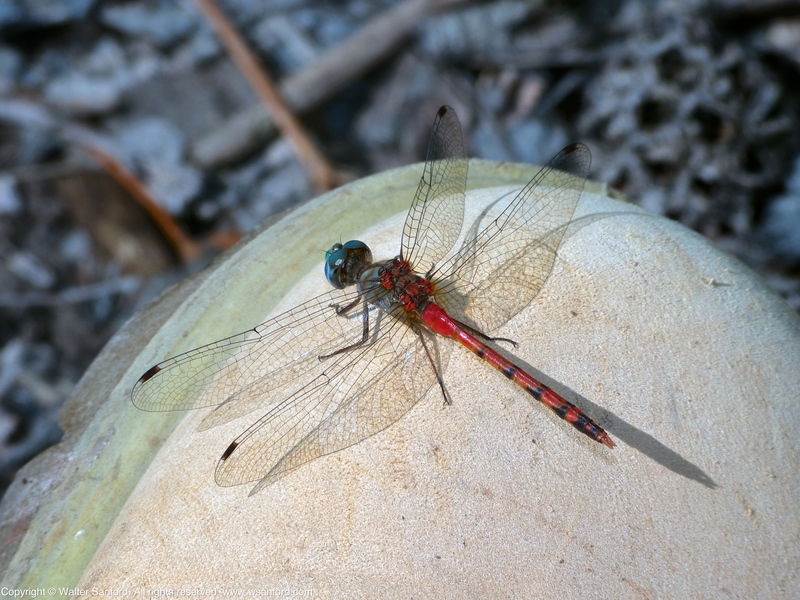 Although the flight period for some meadowhawk dragonflies, including Autumn Meadowhawks (Sympetrum vicinum) and Blue-faced Meadowhawks (Sympetrum ambiguum), is from June to October-November in Northern Virginia, large numbers of meadowhawks don’t appear until fall in the mid-Atlantic United States. I wonder where meadowhawks are during the summer months. 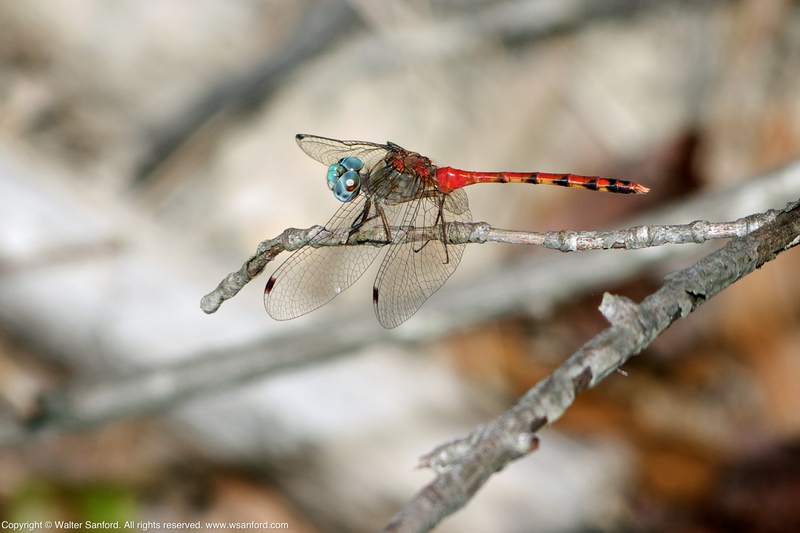 My theory is meadowhawk dragonflies are arboreal. They live in trees for months and burst on the scene at ground/water level when it’s time to mate. I asked Dennis Paulson, author of Dragonflies and Damselflies of the East, for his opinion regarding my theory. Walter, I don’t know if [meadowhawks] are up in the trees, but for sure they are at some distance from their breeding grounds. In Japan, a very common species of meadowhawk emerges from the rice fields in summer, migrates up into the nearby mountains for up to two months, I think, then returns to the rice fields in autumn, many of them already in tandem. 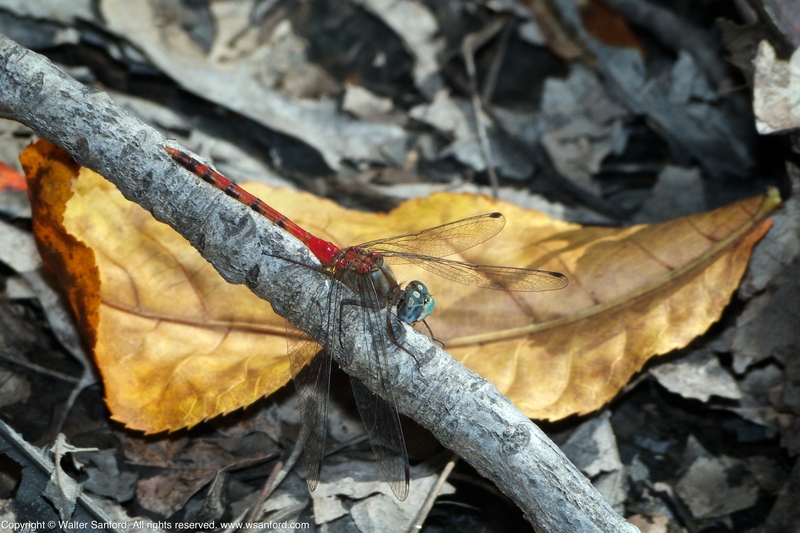 We don’t know if any North American meadowhawk (except Variegated) does anything that extreme, but some people have speculated that at least Autumns spend quite a long time away from the water before returning. 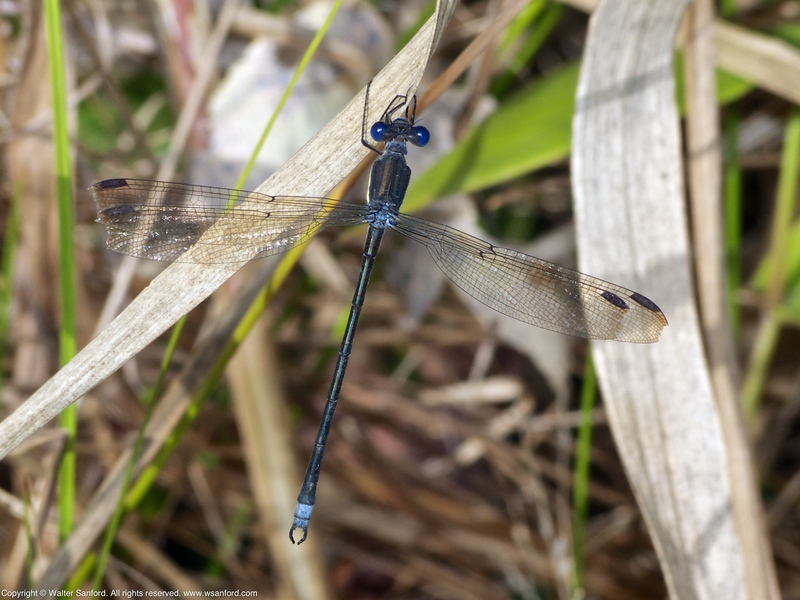 The following photo galleries, shown in reverse-chronological order, feature four female Slender Spreadwing damselflies (Lestes rectangularis) spotted photowalking at Huntley Meadows Park on two days during September 2014: Gallery 1-2 (26/09/2014); Gallery 3-4 (23/09/2014). All four individuals are shown laying eggs (oviposition). 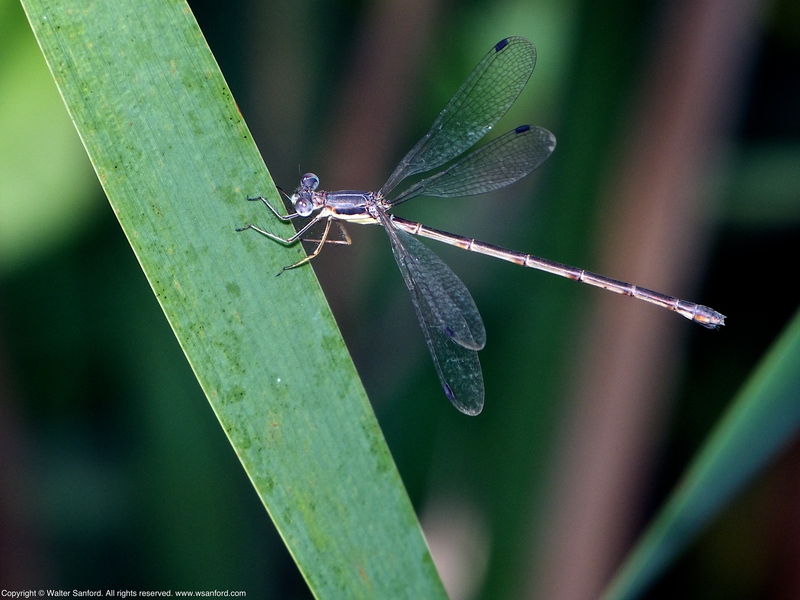 …females oviposit solo, unusual in spreadwings, and about a foot above water. Eggs commonly laid in cattails, one (1) egg per incision. Source Credit: Paulson, Dennis (2011-12-19). Dragonflies and Damselflies of the East (Princeton Field Guides) (Kindle Locations 1682-1683). Princeton University Press. Kindle Edition. 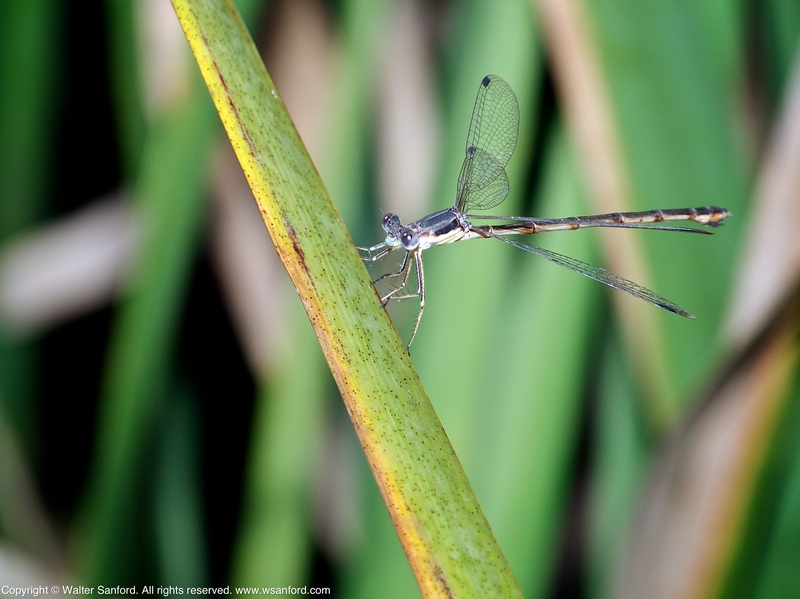 The following photos show a Slender Spreadwing damselfly (Lestes rectangularis) spotted on 17 September 2014 alongside the boardwalk in the central wetland area hemi-marsh at Huntley Meadows Park. This individual is a female as indicated by its terminal appendages and the ovipositor located on the underside of the posterior abdomen. You are currently browsing the walter sanford's photoblog blog archives for October, 2014.